Matt Wofsy is a Licensed Clinical Social Worker with an office in Union Square, New York specializing in anxiety, depression, obsessive compulsive disorder (OCD), trauma, post-traumatic stress disorder (PTSD), and eating disorders. He has particular expertise in supporting young adults in their 20s and 30s with anxiety, depression, work stress, relationships, and family issues. Matt Wofsy is a Licensed Clinical Social Worker in Union Square, New York specializing in anxiety, depression, obsessive compulsive disorder (OCD), trauma, post-traumatic stress disorder (PTSD), and eating disorders. 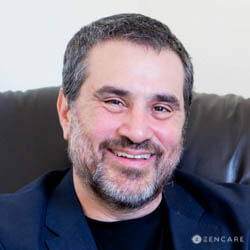 With over 25 years of experience in the behavioral health field, he has considerable expertise in providing individual and couples counseling to young adults navigating the difficulties of mood disorders, relationships, family of origin issues, and work stress. Matt has a particular expertise in helping individuals manage symptoms of obsessive compulsive disorder (OCD). Having advanced trainings in both Cognitive Behavioral Therapy (CBT) and Acceptance and Commitment Therapy (ACT), he utilizes exposure and response prevention to help clients confront their anxiety and obsessions in a purposeful, structured way. He also works with many clients with trauma, delving deep into their narratives to explore emotions and develop tools to move forward meaningfully. Matt is passionate about working collaboratively with his clients to foster strengths and transform the way they respond to life’s challenges. His office is located in Union Square, conveniently accessible by the 14th Street Union Square metro station. "It is my experience that all people have the capacity to face challenges and transform the way they respond to difficult thoughts and feelings. I work collaboratively with people to foster strengths and to develop the tools to move ahead in their lives in a meaningful way."